Lana Williams' vibrant works have been featured in countless shows and exhibitions, but that's not what makes her so interesting. This artist actually learned to paint as a young apprentice, practicing her technique on cardboard and paper scraps in the countryside. 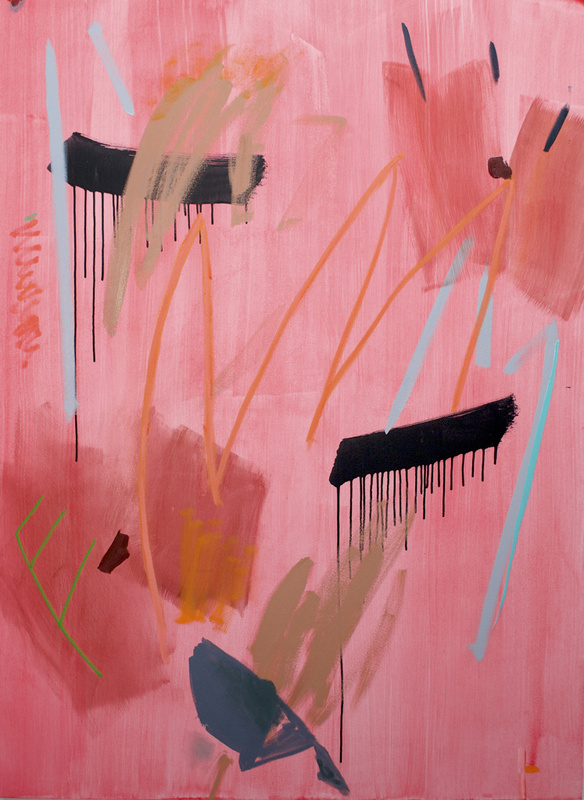 Now, based on the west coast, she's bringing her modern displays of color to various walls of the Bay Area – from The Mill coffeeshop to the Bonanza collaborative at Gallery 16 this Friday – and she's just getting started. Here's a glimpse inside her work, career, and sources of inspiration. Why art? How did you get started as a creative? When I was seven years old I asked my mom for some oil paints. I can't remember what inspired me to ask her, but she bought them. I set up an easel and made my first few paintings – an abstraction, a landscape, and still-life painting of things I found around the house. Little Rock, Arkansas. Just over eight years ago, I moved to the Bay Area for graduate school at the San Francisco Art Institute and stayed ever since. Have you always been an artist? Have you lead any other career path? When I went to college I didn't know what I wanted to major in. I was undecided for the first few years, just taking the required courses. I even took an aptitude test and remember wanting the results to say I should be an artist, which is probably why my main take away was scoring high on finger dexterity. During my second summer home from college, my mom gifted me with an art lesson from a local painter, Barry Thomas. He ended up taking me as an apprentice, letting me paint with him that summer at his studio that overlooking a pond out in the beautiful countryside. It was dreamy. He was a cowboy, and taught me how to "sling plaint." Sometimes we would ride on his four-wheeler to find a spot to paint the landscape and horses. He was the first artist I knew, and that was when I realized I can be an artist. That summer was very important. I learned the discipline of a painting practice. He would make me paint five still-lifes or plein-air paintings a day on cardboard or wood scraps to train my hand and eyes. He taught me to be liberal squeezing out paint on my palette, and the importance of a library. These lessons I still value today, and that was when I knew I wanted to be an artist. I haven't really had any other career path, but have worked lots of odd jobs, such as cheesemonger, face painter, cook, carpenter, babysitter, and personal assistant. Your works are abstract and uplifting. Have they always been that way? My work has always had an uplifting quality, which at times has felt like a difficult position to take. In art school, there was pressure to make highly conceptual or political work. My work did make a big shift in grad school when I finally came into my own voice and wasn't painting in the shadow style of anyone else. But the positive, uplifting, fun, beautiful, or whatever way that quality is described has always been there. It's not something I consciously try to put into my work, but it always comes out. In fact, I once tried to make a darker painting, but it wasn't really scary. I think beauty and art are necessities, more so today than ever in our current world. Sometimes when I get in my studio I'm so in the zone I completely forget to put music on and will work hours before I realize I haven't played anything. When I do remember to put music on I like to listen to something with lots of energy, usually electronic and hip-hop. Who, or what, are some of your biggest sources of inspiration? Inspiration now comes from everything. There was a time when perhaps a particular artist was really inspiring and many artists still are, but there isn't just one thing that directly inspires a particular painting. Usually color first drives my paintings. I will have one or a few colors stuck in my head and know I want to make a painting with them. The rest of the painting is influenced by my mood and intuition. What do you find is the most challenging part of being an artist, and the most fulfilling? The most challenging part of being an artist is making money, selling your work, or even putting a value on your work. You're taught that to sell is to sell-out and real artists are starving artists. If you do sell your work it's commercial and not fine-art, especially if you're not with the right galleries. I think these dialogues are some of the most difficult ones for me to overcome, acknowledge, and share. On the flip-side, there are lots of things about making art that are fulfilling – the act of making, opportunities to show and share the work, the community. But the most fulfilling part is having people enjoy and connect to the work. To know that it has made an impact on someone. Recently, a friend's grandma had to move and could only take a few things with her and one thing she wanted to bring was a painting I had made. When my friend told me this, it really touched me, and that is what is most fulfilling. So many things bring me joy. I love floating in water, it has to be outdoors though, not in one of those float tanks that people are raving about (tried it – not for me). The top things would be: my wonderful girlfriend who makes me laugh, gardening, cooking, baking, and good food; having friends over to enjoy all of those things, and traveling.